The next time you head to your mailbox and pull out an envelope, stop for a moment and think about how it ended up in your hands. Envelopes have been around for centuries. The modern envelope was created in Europe during the 17th century to ensure paper communications were kept confidential, but even references to letters in closed containers can be found in books of the Bible. Today, envelope manufacturers produce more than 185 billion envelopes every year to satisfy the letter-writing and bill-paying needs of people all around the world. The Envelope Manufacturers Association (EMA) promotes the value of letter writing and paper-based communications like the 20.6 billion first class birth announcements, greeting cards and bills that went through the U.S. Postal Service in 2015. Domtar and the EMA Foundation believe that paper and handwriting are important vehicles for communication. That is why Domtar, along with the EMA Foundation Institute for Environmental Studies, partnered with Diamond Envelope, one of our customers, to bring our PaperPal letter-writing program — which connects schools and retirement communities through letter writing and provides a hands-on experience that promotes paper-based communication — to an elementary school in St. Charles, Illinois. Fifth graders at St. Patrick Catholic School were paired with residents of a nearby retirement community, The Geneva Place in Geneva, Illinois. Using envelopes they create, the students will exchange letters four times during the school year with the senior citizens at The Geneva Place. The project will give both groups an opportunity to experience the joy of receiving a handwritten letter and to practice their letter-writing skills. Diamond Envelope vice president and general manager Michael Jania taught the students how to write a letter and address an envelope. Domtar introduced the PaperPal program in 2015 at a school and retirement community in Van Nuys, California. The letter-writing initiative has since spread across the United States and Canada, including in a community near our Kamloops Mill in Kamloops, British Columbia. Handwriting offers cognitive benefits for children and adults. Studies show it helps students learn better and retain information longer. Writing by hand also activates regions of the brain responsible for thinking, memory and language. 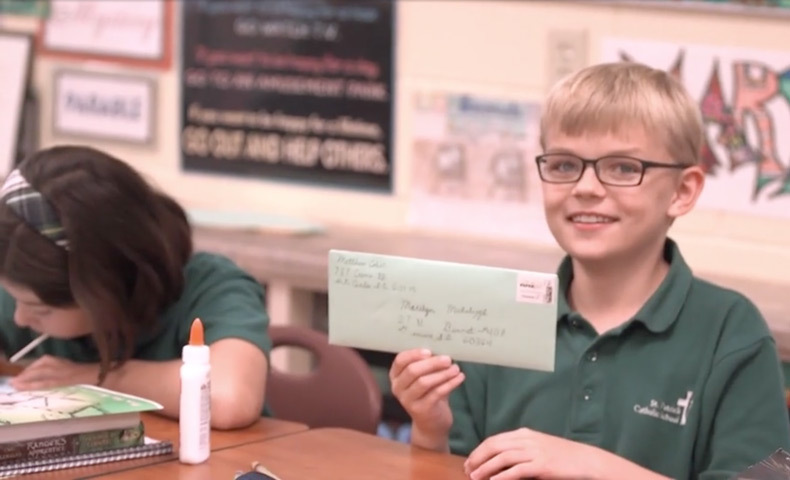 Watch our “Connecting Generations Through Envelopes” video to learn more about PaperPal at St. Patrick Catholic School.